GDP Now: Wall Street’s promise of Escape Velocity is a joke. The consistency with which nearly every report on the US economy has deteriorated over the last few months is astonishing. Only the jobs report has been spared that sharp downdraft. So we blame the weather, which in parts of the US was truly atrocious, while in other parts, particularly in California, it was gorgeous. Too gorgeous. This is supposed to be our rainy season, but every day the sun is out as we’re heading into our fourth year of drought. Yet the drought isn’t what keeps people from shopping or companies from ordering equipment. So out here, we’re baffled when the weather gets blamed. Today’s durable goods report for February was another shot at this wobbly edifice of the US economy. New orders for manufactured durable goods dropped by 1.4%, the Census Bureau reported. It was the third decrease in four months. Transportation equipment fell 3.5%, also the third decrease in four months. Excluding transportation, new orders – “core” durable goods – fell 0.4%, down for the fifth month in a row. And Core Capital Goods New Orders, considered an important gauge of business spending, fell 1.4%, down for the sixth month in a row. The weather is really hard to blame for this, so folks blamed the strong dollar and slack demand in the US and globally. The data was bad enough to push the Atlanta Fed’s GDPNow model of the US economy down another step toward zero growth in the first quarter. The Atlanta Fed started the model in 2011 to offer a more immediate picture where the economy is headed. It takes into account economic data as released and adjusts its GDP forecast for the quarter as it goes. The model is volatile. It reacts to incoming monthly data that are themselves volatile and subject to sharp revisions. So a few strong releases for March could turn this thing around on a dime. But we’re still dealing with the reality of January and February; the data has been crummy, and the Atlanta Fed’s “nowcast” is increasingly depicting an economy that is losing its struggle with growth. 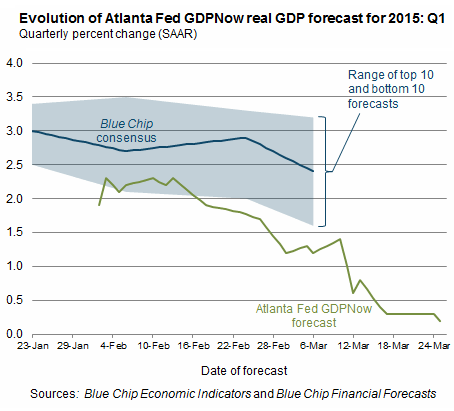 The blue area in the chart is the range of the “Blue Chip” consensus forecasts. Even the most pessimistic among these forecasters appear to be way too enthusiastic, though they’re also whittling down their exuberance. In its last report, the Atlanta Fed mentioned drilling activity in the oil patch, as measured by the collapse in the rig count. This time around, it identified the lack of investment by the broader business community – the decline in “real equipment investment and real inventory investment” – as the main culprits. And it leaves GDPNow just a couple of lousy reports away from dipping into the negative. And Wall Street’s promise of “Escape Velocity,” the miracle speed that the US economy would achieve in the near future to pull out of its sluggish orbit and move to the next level? That promise has been propagated for years. Each time, and with relentless regularity, it turned into just another false Wall-Street promise whose purpose it was to rationalize stock prices that have defied rationalization, and drive them even higher. And in doing so, the year-after-year promise of “Escape Velocity” has become a joke. The Fed has floored the monetary accelerator with its steel-capped, lead-lined boot for over six years. Other central banks have followed. They expected, or pretended to expect, that it would create demand, economic activity, and consumer-price inflation. None of which happened. Instead, it created a “bond bubble” that is becoming “more extreme” and stock markets that are “overvalued,” according to 11,000 financial professionals. Read… The “Insanity Trade:” Where Does It Go From Here? This is going to go down in the history books. The economic fundamentals across the world are abysmal. The Central Banks and governments have done everything in their power to convince people everything will be fine. After 7-8 years of no growth and busted promises, most people have figures out the system is bankrupt. Demographics will be the primary driver. Developed economies and China have huge near-retirement sector. That sector now clearly understands the challenges ahead. Denial has been washed aside. Most people are in retirement shock. This is driving the sudden and significant drop in demand. Combined with debt saturation and an inflated cost structure across the developed economies, there is only one thing that can happen. We are going to see a SNAP DEPRESSION within the next 6 months. It will be worldwide. The CBs will be powerless. The entire economy is a joke. I was looking thru a women’s fashion magazine, they are selling flip flops that cost $595, that’s a set of tires for my car. A French handbag was $13,700, isn’t the Euro suppose to be weak? Even the wrinkle cream is $200. Maybe this is why nobody is shopping. No worries as they will make up some #s to get people excited followed by revision 1 and 2 months later to derive at the “actual” (nevertheless massaged) #s.
Besides the fact is that most of the GDP “growth” of the past couple of years were due to Obozocare spending anyway. I mean show me the GDP of actual mfg instead of services! We’ve passed beyond the event horizon of this financial black hole. There is no escape, only destruction ahead. What I can’t understand is how blind people are. At my brokerage, practically nobody considers the possibility of a crash. You’d think it had never happened before, yet it’s happened twice since 2000. Our top analyst thinks the current market is fundamentally strong, and that QE and buybacks have little to do with the market’s gains. It’s like working at an insane asylum. This thing needs to crash, and it needs to crash hard. Wow that’s incredible. I’m an “outsider” and always have trouble believing that today’s market participants are truly clueless so it’s always nice to hear stuff like this. Makes me feel less insane. Michael, don’t hold your breath waiting for those responsible to be punished. Obama’s nomination to replace Eric Holder, Loretta Lynch, is not going to indict any of the Wall Street criminals. She sat on the Board of Directors of the Federal Reserve Bank of New York from 2003 to 2005. Timothy Geithner was President of that fine upstanding institution at that time. Ms. Lynch is queen of ‘Civil Forfeiture’ and is on record as defending the NSA’s warrantless disregard of the 4th Amendment as being Constitutional. It certainly cant go on like this but the tricky part is figuring out ‘WHEN?’ I’ve given it some thought and come to the conclusion that it will not be a discrete event but, rather, a process. More like a slow-motion train wreck. And that we’re in it at this very moment. You can pick the moment in time when the nose of each locomotive hit: when the Fed was created; when Nixon took us off the gold standard, etc. Your call. But, I would say where we are now is at the frame in the slo-mo where the wheels are starting to come off. So, my suggestion is to stop asking ‘When?’ Because the answer is ‘NOW’, and will be for the foreseeable future. Thanks for your insider look at things. I am just a retired guy who put his money into safe cash instruments about 3 years ago and have suffered the ‘looks’ since that time. I have not been shy to share my belief that this market is absolutely crazy and not based upon anything. You know what? I am done sending out any warnings, although I will forward this article and comments on to those friends of a like mind set. My American sister and her husband actually believe Janet Yellen is wonderful and all is well. I am 59. My brother-in-law is 72. (Still working). All I said was, “I hope you don’t have necessary money in the market.” They looked at me like I am nuts. I am waiting for their reaction when it tanks. I won’t say a damn thing. We are witnessing the death spiral of Euro-style socialism. The world, including the US, has finally run out of other people’s money. Anti-business, anti-energy, high-tax, uber-regulations, welfare and big government have stalled, if not broken, the economic engine. We have lost 7 years heaping on more debt in a futile attempt to borrow our way out of bankruptcy. The Keynsians should be banished permanently or at least have the decency to withdraw to the ash pile of history. Paulo I think we’re all there. I used to believe in the adage that if you throw enough crap at the wall some of it would stick. Now there’s a force field in front of the wall that vaporizes any logical argument, LOGIC ITSELF, is the enemy. My real world example of this is the 2009 J.J. Abrams Star Trek movie which I think of as Star Trek TGOL – The Genocide of Logic. In the movie the Vulcan race AND it’s offshoot the Romulans are both destroyed. Spock’s mother is killed off for the crime of having married a logical man, and Captain Pike’s logical exec is nowhere to be seen. Spock spins out into some weird daunce Savauge with Uhura, completing Reason’s downfall. Understand that Abrams is wishing he could accomplish this IN REAL LIFE.